If you're reading this, you're probably already familiar with the popular card game Dominion. Dominion is so successful that it's crossed the line between gamers and non-gamers and, like Blokus and Carcassonne before it, is poised to be available at mainstream toy and department stores like Toys R Us. Until then, however, we have to obtain our copies of Dominion and its expansions singly or in a Dominion card game bundle as listed below. I've put together five great ways to get two or more versions of Dominion at once, bundled together at a hopefully discounted price — we'll get into that in more detail in each listing. Note that as of this writing, retail prices for Dominion and expansions were the following. Games like Dominion can often be easily found for 30% less than retail. Our first Dominion game bundle in the list is also probably the best deal. 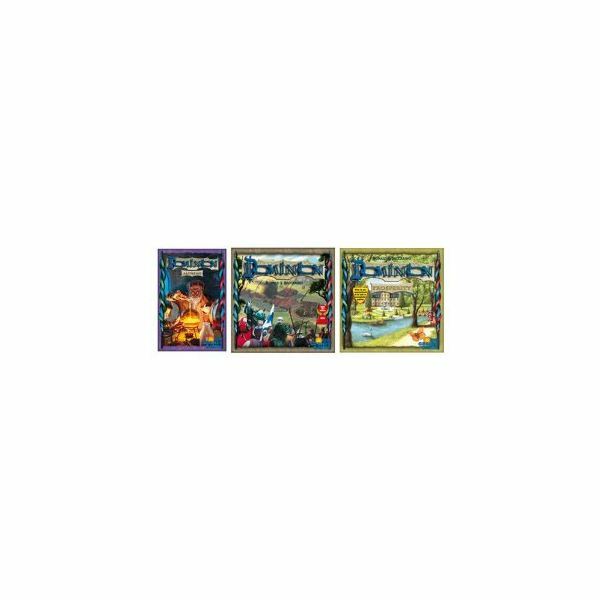 It gives you three Dominion games/expansions: the original Dominion and the two newest expansions, Alchemy and Prosperity. Normally all three editions would retail for $124.97. At $79.76, the current Amazon price, you're getting a nearly 37% discount. What's the catch? There is a small catch, of course. This is a "big box" edition, which means the cards for all three games are in one large box, and you save some space as opposed to buying the editions separately. On the other hand, if you enjoy having separate editions, the Big Box may not be for you. Note that the Big Box also contains two promo card sets — Black Market and Envoy — along with a colored play mat. 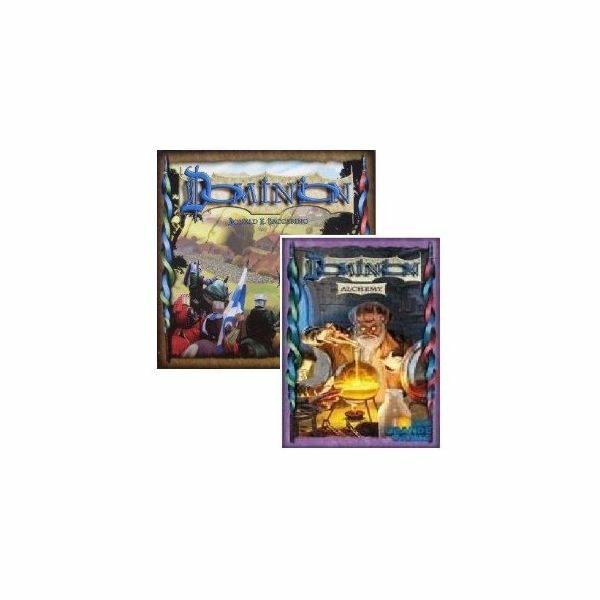 If you want to purchase the Dominion base game and the Alchemy expansion together, you can get them for $69.95 bundled currently. However, this isn't a very good deal at all, as they can be purchased separately right now for a bit over $60. If you've had a taste of Dominion but don't own it yourself, and you'd like to try out Alchemy's unique Potions currency mechanic, you could either keep an eye out for this bundle's price to fall or simply buy Dominion and Dominion: Alchemy separately. Dominion, Intrigue, and Seaside are a great combo to start playing Dominion with, being the original game plus the first two expansions. At a current cost of $119.25, this three-game bundle is a decent savings over the list price, but not quite that magic 30% cheaper that we're looking for. However, it's a good option if you can't find the games at a lower price separately, which is possible because this Dominion bundle does offer a discount. This Dominion bundle is different from the others in that it's just the base game — bundled with plastic card sleeves! In a game like Dominion, where you are constantly shuffling cards, wear and tear quickly becomes an issue, and most games wind up purchasing card sleeves for their Dominion collection. This bundle, from Cool Stuff Inc., comes with 500 sleeves, enough for the entire game. Normally, sleeving the base game would run $10 to $20 or more, depending on the sleeves you buy, so this could be a good deal at $50.49. For the completist, the Dominion Complete Set Bundle from Cool Stuff Inc. will deliver every Dominion expansion to date to your door in one fell swoop, and all for $125.99 — a great deal. 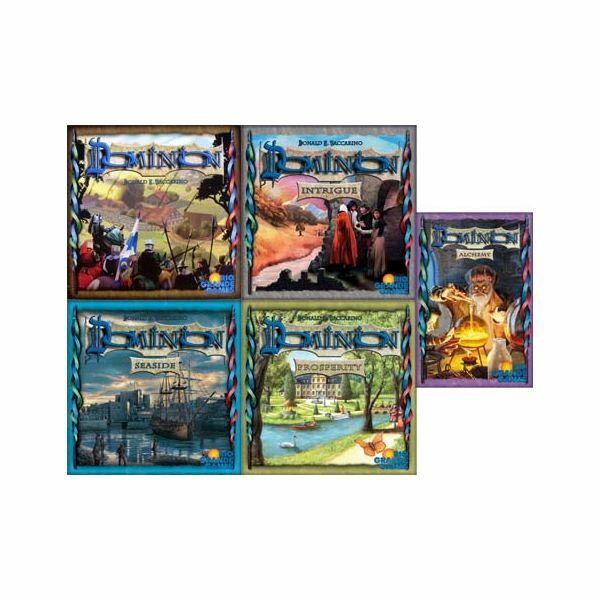 This Dominion card game bundle includes the base game, Intrigue, Seaside, Alchemy, and Prosperity. At about a 40% discount off of list, this bundle is a great way to get every Dominion edition extant at once. Reviews of Dominion and expansions along with helpful buying guides and recommendations. What's the Best Dominion Game Bundle?